The ozone hole that forms each year in the stratosphere over Antarctica was slightly smaller in 2013 than average in recent decades, according to NASA satellite data. The ozone hole is a seasonal phenomenon that starts to form during the Antarctic spring (August and September). The September-October 2013 average size of the hole was 8.1 million square miles (21 million square kilometers). For comparison, the average size measured since the mid-1990s when the annual maximum size stopped growing is 8.7 million square miles (22.5 million square kilometers). However, the size of the hole in any particular year is not enough information for scientists to determine whether a healing of the hole has begun. "There was a lot of Antarctic ozone depletion in 2013, but because of above average temperatures in the Antarctic lower stratosphere, the ozone hole was a bit below average compared to ozone holes observed since 1990," said Paul Newman, an atmospheric scientist and ozone expert at NASA's Goddard Space Flight Center in Greenbelt, Md. 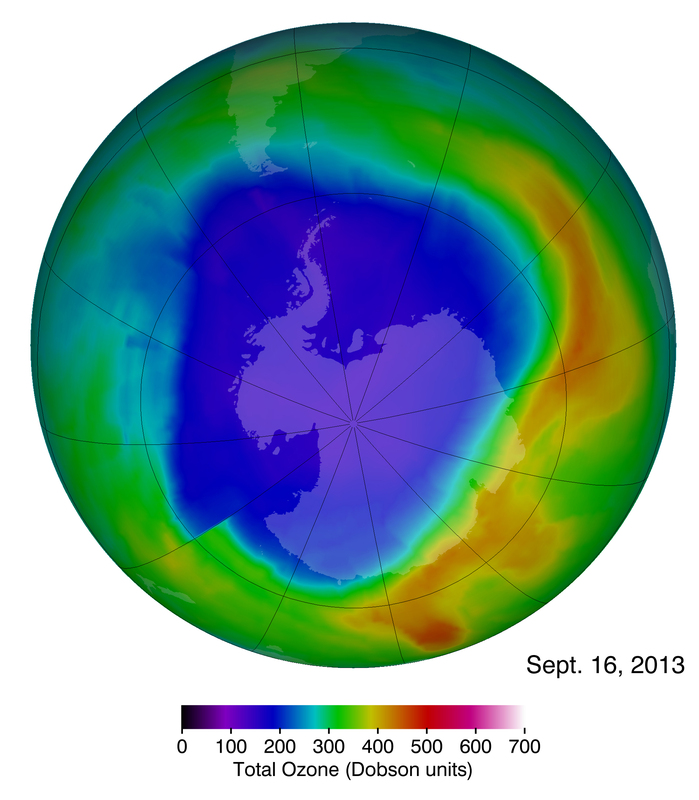 The Antarctic ozone hole reached its maximum single-day area for 2013 on Sept. 16. The ozone hole (purple and blue) is the region over Antarctica with total ozone at or below 220 Dobson units (a common unit for measuring ozone concentration). Daily images from Jul. 1 to Oct. 15 show the evolution of the 2013 ozone hole. The ozone hole maximum occurred on Sept. 16, 2013.